Description: The MasterWorks series MW331 theatre organ is a 3 manual 31 rank Wurlitzer theatre organ that contains pipe samples from some of the finest theatre organs located around the United States. Designed to the exacting specs of world leading theatre organist Jelani Eddington, the specification and layout of the instrument are a theatre organist's dream come true. 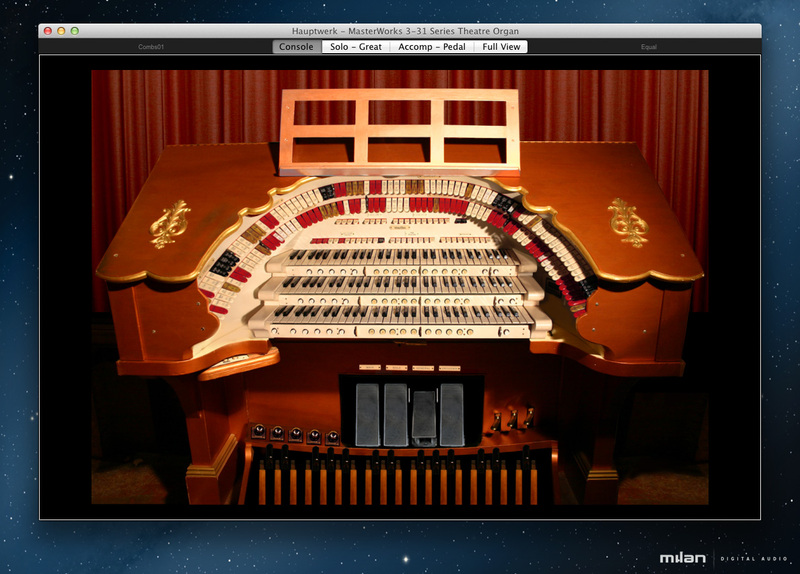 The MasterWorks 331 virtual instrument features interactive on-screen graphical controls. Animated stop tabs, couplers, foot levers, pistons and other controls are all accessible via MIDI input or by touch screen. Console - The original console with all controls. Solo - Great - All controls for the Solo and Great. Accomp - Pedal - All controls for the Accompaniment and Pedal. Full View - All controls on a single page.